The traditional way of doping (adding impurities to) silicon wafers with boron and phosphorous is to introduce a small amount of boron during the Czochralski process in step #3 above. The wafers are then sealed back to back and placed in a furnace to be heated to slightly below the melting point of silicon (2,570 ⁰Fahrenheit or 1,410 ⁰Celsius) in the presence of phosphorous gas. 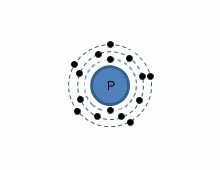 The phosphorous atoms "burrow" into the silicon, which is more porous because it is close to becoming a liquid. The temperature and time given to the process is carefully controlled to ensure a uniform junction of proper depth. A more recent way of doping silicon with phosphorous is to use a small particle accelerator to shoot phosphorous ions into the ingot. 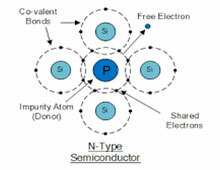 By controlling the speed of the ions, it is possible to control their penetrating depth. This new process, however, has generally not been accepted by commercial manufacturer.